My testimony today will focus on issues that are particularly relevant to state regulatory officials. States established appraiser licensing and certification programs as a result of the Financial Institution Reform, Recovery and Enforcement Act (FIRREA) of 1989. These agencies issue appraiser licenses and certifications to those individuals who possess the education and experience requirements promulgated by the Appraiser Qualifications Board of The Appraisal Foundation. The agencies also oversee compliance by appraisers with the Uniform Standards of Professional Appraisal Practice (USPAP), state law and agency rules. These programs have been set up in a variety of ways; however, most fall into one of the following categories. Some states have an umbrella licensing agency that handles all occupational licenses for the state. Others have a stand-alone agency that handles real estate broker and/or appraiser licensing. Finally, there are states, such as North Carolina, that have an autonomous board set up by statute. Appraisal boards are funded in different ways. In an umbrella agency, licensing fees are sent to the state, and the state manages its personnel and funds its operation. In a stand-alone agency, fees are collected by the state and the agency then receives an appropriation to meet its budgetary needs. Most autonomous boards keep the fees they receive, and do not receive any state funding. Since there are territories and small states that have a few hundred or fewer appraisers, while one state has over ten thousand, the large disparity in the numbers of appraisers makes it difficult to establish one method to operate state appraisal programs. There are also different approaches with regard to staffing. Most programs have an administrator or executive director that manages day-to-day operations; however, based on the number of appraises licensed by the board, it may be necessary for the administrative staff to manage multiple licensing programs to maximize economies of scale. States also use different approaches for investigations. Some have a pool of investigators available to all licensing boards. Others contract with appraisers on a per-case basis to assist staff. Some appraisal boards have staff investigators who in some cases are former law enforcement officers, while other states use appraisers who have been trained in investigations. State programs generally have legal representation provided by their state attorney general’s office. Some of these attorneys are assigned on a per-case basis, while others provide a part time or full time attorney that deals solely with appraisal board cases. Attorneys who are not assigned solely to the appraisal board may have a case load involving cosmetologists, funeral homes and plumbers in addition to appraisers. Boards who have administrators, investigators and attorneys who are not trained in real estate appraisal are dealing with specific standards of practice and appraisal methodology. Even though they may obtain training in appraisal standards and methodology, it is difficult to sustain a level of competence when not dealing with these types of cases on a full-time basis. State legislatures do not understand that appraisal boards have requirements that other occupational licensing boards do not have. For example, the Appraisal Subcommittee (ASC) issues Policy Statements that reflect the general framework they use when they review a state for compliance with Title XI. Policy Statement 10 states that “State agencies need to process complaints of appraiser misconduct or wrongdoing on a timely basis. Absent special documented circumstances, final State agency administrative decisions regarding complaints should occur within one year of the complaint filing date.” States where the appraiser program is housed within an umbrella agency may not be able to comply as they are not provided with sufficient resources to resolve cases. Often state officials do not understand why this one licensing agency must be given priority when the state’s backlog for other occupations is just as great. Although the ASC often points out that it is a state issue and not just an agency issue, when states are facing the significant funding problems that they have today, appraiser programs may face a reduction in funds and may be subject to having their funds swept into the state treasury for other uses. Like most regulatory agencies, appraisal boards respond to complaints; they don’t generally initiate investigations. An appraisal is an opinion of value, and it is difficult to dispute someone’s opinion. Appraisal fraud involves the intent to deceive someone in the making of an appraisal, or at least some evidence of conspiracy. It is nearly impossible to prove an appraiser’s intent to defraud by looking at an appraisal report. For that reason, law enforcement officials have often shied away from involving appraisers in a civil or criminal fraud case. In addition, to get them to pursue such a case, a fairly high financial threshold of harm must be present. They are more likely to pursue other players in a fraud scheme, such as mortgage brokers, developers and attorneys. Several states have created or participate in task forces to deal with mortgage fraud. These task forces have banking, appraisal and real estate regulators, as well as state and federal law enforcement. This helps the members identify common participants in different fraud schemes, and to offer support to each other in prosecution of these individuals. State and federal law enforcement agencies, however, often are not able to share information with state appraisal boards and other regulators due to confidentiality laws and the concern that their investigation could be compromised. As a result, the task force is more beneficial to law enforcement in obtaining information than it is to regulators in the investigation of their own cases. A big obstacle for appraisal boards is that often problems with loans and appraisals do not emerge until several years after a loan was made, when properties go into foreclosure or homeowner attempts to sell or refinance. It becomes more difficult to investigate an appraisal when a significant amount of time has passed, as an appraisal is an opinion of value as of a specific date in time. There may be changes in the property’s condition and in market forces; also, data available to the appraiser at the time of the appraisal may no longer be available, and the appraiser may have destroyed his records (USPAP only requires that an appraiser keep his records for five years). Complaints were often not originated at the time the appraisal was performed, as many of the participants who are now complaining about low appraised values did not see a problem when values were meeting or exceeding sales prices. Appraisers found to be involved in mortgage fraud schemes often didn’t realize what they had gotten into. They may have drawn into schemes orchestrated by other unscrupulous players who withheld information from them or deliberately gave them erroneous information. Often they did not receive any additional fee or payment for participating in a fraud scheme; they were brought into it with the promise of a number of future assignments. In one instance in North Carolina, the investigator discovered that the appraiser had received a large payment that was noted on the HUD-1 settlement statement. This helped the appraisal board revoke the appraiser’s license, and they were successfully prosecuted in federal court; however, it is seldom that this type of “smoking gun” is present. Although there is always a potential for mortgage fraud, the significant increase in scrutiny in underwriting of appraisals makes it difficult to perpetrate many of these schemes; however, it has also resulted in tightened guidelines for appraisers and loan requirements for borrowers. Appraisal management companies (AMCs) have existed for many years. In March 2008, Fannie Mae entered into an agreement with the New York Attorney General’s office to adopt certain policies relating to appraisals for loans delivered to them. This agreement established the Home Valuation Code of Conduct (HVCC). As part of the HVCC, loan originators on commission were forbidden from selecting an appraiser for a particular appraisal assignment or from having any substantive communications with an appraiser relating to valuation, including ordering or managing an appraisal assignment. As a result of the HVCC, many more AMCs were established, and appraisers performing appraisals for residential loans were, for the most part, required to sign up with AMCs in order to obtain assignments. It is our understanding that in some cases, the AMCs were established or operated by former mortgage brokers or appraisers who had been sanctioned or lost their license to practice. There were no laws or regulations in place that prohibited these individuals or those with criminal backgrounds from setting up and managing these companies, even as they became such an integral part of the mortgage process. As a result of the Dodd-Frank Wall Street Reform and Consumer Protection Act, all states will now have to register and supervise AMCs. A majority of states already have implemented a registration program, and issues have begun to surface. One is how to determine whether a company actually is an AMC. There are several electronic or portal companies that recruit, manage, send assignments, review appraisals, send appraisals back to the appraiser for changes, and transmit payment to the appraiser. Many traditional appraisal firms use subcontractors to perform assignments rather than have appraisers employed by the company. This has raised the issue as to whether these appraisal firms are acting as an AMC and must be registered as one. Various state legislatures have taken a strict view and required appraisal companies to register, while others have tried to limit registration to those who perform the full spectrum of appraisal management functions. In discussion with the staff of the Consumer Financial Protection Bureau (CFPB), it was obvious that it is very difficult to define an AMC for purposes of legislation and rulemaking. Although AMCs do largely create the firewall envisioned by the HVCC, it has created the situation where it is hard for consumers, real estate brokers, builders and other users of appraisal services to provide necessary information to the appraiser and to express concerns with the appraisal itself. As AMCs have become more an integral part of the appraisal process, many consumers do not understand or are not aware of their role. Consumers may pay the AMCs invoice, which they consider to be substantial for an appraisal, but they do not understand that the appraiser receives only a part of that payment. It is not uncommon for AMCs to prohibit appraisers from speaking with any parties to the process, such as brokers, builders or borrowers. After the inspection is performed and the appraisal is transmitted to the AMC, the AMC may send the appraiser several requests for information, which can delay the transmission of the final appraisal to the lender. These situations increase consumer frustration, and this hostility is directed towards the appraiser. As a result of this misunderstanding, a consumer may file a complaint with the appraisal board. Appraisers have their own concerns in dealing with AMCs. One AMC has numerous pages of instructions to the appraiser as to how to perform the appraisal. 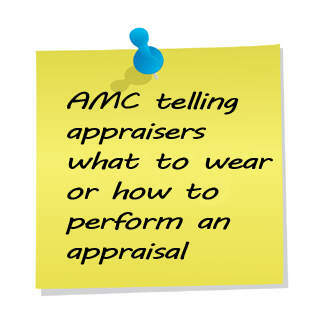 Another AMC tells appraisers what to wear when inspecting properties. Some appraisers are receiving assignments to appraise properties that are out of their market area. Even though they are required by USPAP to be or to become geographically competent to perform an appraisal, they feel pressured to accept these assignments in order to continue to receive work from the AMC, as well as the financial pressure of needing the income from these assignments. Some AMCs are slow to pay appraisers, even when faced with state laws giving them time limits for payment. There are instances where an AMC will automatically remove an appraiser from their panel if the appraiser has any form of disciplinary action, including a reprimand or the requirement of additional education which is based on a technical violation of a state’s rules. Appraisers who do not comply with the AMC’s requirements or who complain against an AMC fear removal from the AMC panel, which could, in turn, limit their ability to receive work from other AMCs and result in a large loss of income. State appraiser boards have their own issues with oversight of AMCs. An overlying problem for boards is that they must license two entities, appraisers and AMCs, whose interests are often at odds. Each group may attempt to get legislators and state boards to adopt laws and enact rules that impact the other’s ability to function. Most state legislation to date focuses on registration of AMCs, not regulation. Boards have limited ability to oversee the functions of an AMC unless there is evidence of a violation of appraiser independence. When complaints are received, it will likely be difficult for agencies with limited funds and personnel to investigate corporations that usually are not domiciled within their state. For example, in North Carolina, there are 144 AMCs registered, but only 6 are headquartered in the state. Hopefully, once rules are adopted by the CFPB and minimum requirements for states are defined by the Appraisal Subcommittee, many of these issues with regard to AMCs will become clearer. Automated Valuation Models (AVMs), Broker Price Opinions (BPOs) and other evaluation products are generally not regulated by appraiser licensing boards, unless they are performed by an appraiser in violation of state licensing laws. In many instances consumers do not realize the difference between these products and may think they are receiving an appraisal, when an appraiser is not actually involved in the process. The North Carolina Appraisal Board received a complaint from a consumer earlier this year regarding what she thought was an appraisal. The letter valuing property gave her an estimate of what the property was worth, and she was charged $450 for the valuation. It turned out that this was not an appraisal, but was a statement of worth from a real estate broker. Although the Appraisal Board referred this matter to the North Carolina Real Estate Commission, there are currently no standards of practice for BPOs and there is limited authority to discipline brokers for errors in the development of a value. Some states have no restrictions on the preparation or use of BPOs, while others have laws that severely limit the use of BPOs to traditional brokerage services such as listing or selling properties. If a BPO is not done by an appraiser, state appraisal boards don’t regulate this product and there is no requirement that the person performing the BPO conform to the Uniform Standards of Professional Appraisal Practice (USPAP). Many states that allow BPOs have no minimum education or experience requirements to perform this service, and have not adopted guidelines or standards for brokers to follow in the preparation of this product. BPOs and other alternative valuation products, therefore, are not sufficiently regulated. An investigator training program was presented to state regulators at no cost to their agencies. This program was developed by AARO members, administered by The Appraisal Foundation and funded by the ASC. A task force of these three groups explored issues surrounding the supervision of trainees. Since that time the Appraiser Qualifications Board (AQB) of The Appraisal Foundation has developed criteria that will be mandatory for states in licensing and overseeing trainees and their supervisors as of January 2015. Another task force of the three groups developed a Voluntary Consistent Enforcement Matrix to provide guidance to states as to how various types of USPAP violations could be sanctioned. The groups developed, filmed and have made available to states a Mock Administrative Hearing as an education tool for appraisal board members and staff. This hearing was done at an AARO conference with many state regulators in attendance. The ASC and The Appraisal Foundation have made themselves freely available to AARO conferences and meetings. The Appraisal Foundation has scheduled meetings of its boards (the Appraisal Standards Board and the Appraiser Qualifications Board) in conjunction with AARO meetings in order to allow state regulators to attend the meeting and encourage participation in AARO. The Appraisal Foundation also put together a State Regulators Advisory Group (SRAG) in order to provide direct input to the Foundation. The SRAG meeting is another opportunity for the three groups to work together as the ASC participates in that meeting as well. These meetings are also held in conjunction with AARO conferences. The Appraisal Foundation issues exposure drafts and requests comments when there are proposed changes to USPAP or the appraiser qualification criteria. This results in these being thoroughly vetted and minimizes unintended consequences. The ASC provides assistance to states as needed when the states are drafting rules, and when there are potential changes in legislation that could impact the state’s ability to comply with FIRREA. A representative of the appraisal industry and/or the appraiser regulatory community should be given a seat on the Appraisal Subcommittee. There should also be an appraiser regulator on both the Appraiser Qualifications Board and Appraisal Standards Board of The Appraisal Foundation. Having a state regulator on these groups will allow them to receive direct input as to how their decisions will affect implementation and enforcement of requirements. Explore the possibility of having a national repository for each appraiser’s records. This would include qualifying education, continuing education, the date and types of examinations passed, a comprehensive background check and licensing history, including documentation of any disciplinary action. This could be accomplished either through expansion of the ASC National Registry database or a system similar to the National Mortgage Licensing System. An appraiser should only have one record on the National Registry, not a separate one for each state in which the appraiser is licensed and for each credential which the appraiser has held. A similar repository should be established for appraisal management companies (AMCs). Funding for developing and administering such a system may be available through grants from the ASC or as part of a state’s licensing and renewal process. Current ASC meeting procedures do not encourage attendance by the public and should be changed. In the past, a large portion of each meeting was held in closed session. Recently the meetings have become more open, but there are still impediments to the free flow of information to the ASC at their meetings. Anyone wishing to attend must preregister in advance. Participants must have a valid government issued photo identification, and go through a security screening, in addition to being personally escorted to and from the meeting area. Although it is understandable that some level of security is necessary, meetings should not be held in buildings that require this procedure. These are public meetings, and the public should not be discouraged from attending, even if they choose to attend without advance registration. Registration could be required to address the ASC. There needs to be a method where a state can ask the ASC for guidance without fear of repercussions. A state may be reluctant to request assistance or information out of concern that asking a question will be flagged for the next ASC review of the state. It is possible that a state could have had several reviews, but if something is later discovered and the state asks for guidance, the ASC will still cite this as an area of concern in a future review. State boards and appraisers should be able rely on their procedures if a review have found them to be in compliance. If the ASC later determines the state’s rules are out of compliance, the state should be able to correct the issue without a finding against the state and the potential removal or suspension of an appraiser’s credential. Policies that are necessary for consistency across states must be mandatory by federal law. The development of a universal complaint form and of an AMC application form have been discussed, but will be difficult to achieve absent a federal mandate that all states accept a particular form. Some states require that a complaint be notarized and completed on a state-specific form, while others can accept anonymous complaints. If universal forms are truly essential for the oversight of appraisal regulation, this needs to be addressed in federal law. This issue also applies to reciprocity where there are clear mandates for temporary practice, but no such requirements for reciprocal licenses. The policies and procedures of the ASC need to be more transparent. There is little or no input allowed by stakeholders, such as state regulatory officials and the appraisal industry. The Appraisal Foundation’s Boards, the AQB and the ASB, each have a lengthy and thorough exposure draft and comment system where comments are actively solicited and revised drafts are issued for further comment. ASC Policy Statements, bulletins, memoranda and review criteria should have similar exposure and comment. Currently, we understand that ASC Policy Statements are under review and are in the process of being changed. Although this process has been underway for several months, states and members of the appraisal industry still have not had the opportunity to see a draft or to have an opportunity to comment. The Dodd-Frank Wall Street Reform and Consumer Protection Act has given the ASC more enforcement tools, the ability to make grants to the states, and oversight of the AMC registration process. The lack of enforcement tools was a serious omission from FIRREA and created a situation where derecognition was the only penalty available to the ASC for violations. Given the devastation it would have had to a state’s real estate industry, the ASC has never used this tool, and states have realized that such drastic a measure was unlikely to be utilized. Now that the ASC has these new tools, it remains to be seen what effect this will have on the oversight of the state appraiser programs. A nice effort but wasted effort to say the least. These guys just don’t seem to get it. They would do well to study American literature. The guys who testify in these meetings are far more interested in globe trotting than focusing on the simple problem (no not counting cats). HVCC was to the appraisal profession as the Atom Bomb was to Hiroshima. Three years have passed and these groups can’t even agree on what went wrong. Do we honestly believe they have the competence to solve the problem and reassemble the pieces that have been blown from Virginia to Hawaii. Imagine calling into the state board to complain about an amc, only to find that same amc has their rep sitting on your state board.